Mayor Martin J. Walsh’s office will give reproductions of “Transit” as gifts to visiting diplomats. In Adam O’Day’s vision of Boston, the sky is a patchwork of turquoise, green, yellow, and gray, and the Prudential Tower and its neighboring skyscrapers are colored in hues of red, orange, and blue. Cars and a train seem suspended on the gold and turquoise lanes of the Massachusetts Turnpike. The phantasmagoric portrait — “Transit,” O’Day calls it — won a citywide competition Tuesday that sought paintings of contemporary Boston. Mayor Martin J. Walsh’s office will purchase 30 reproductions of the piece to give as gifts to visiting diplomats and other distinguished guests. “Transit” was one of five finalists chosen by the Art Commission and the mayor’s office from 86 entries. Voting for the winner was opened to the public through the commission’s website and social media sites, Goodfellow said. The mayor’s office will pay just more than $3,300 for the 30 reproductions, she said. The initiative was thought up by the Walsh administration as a way to highlight local artists and elevate Boston as an arts hub. “Transit” offers a westward perspective of the skyline as seen from the Berkeley Street overpass stretching above the Massachusetts Turnpike. O’Day said he used bright hues instead of the skyline’s actual gray and blue to show Boston as full of life and movement, even if the cold weather can make the city seem frozen in place. Movement is the main theme of his painting, which he made from acrylic, enamel, and polymer last fall, O’Day said. A commuter rail line is about to leave Back Bay Station, while several cars hurtle down the turnpike. Congealed paint droplets running down the portrait add a sense of dynamism. “Realistic colors don’t exactly get what you’re going for,” said artist Adam O’Day, “I use the layers of different colors to get a feeling of depth. Though he does not like to define his style, O’Day said his work contains elements of expressionism, in which artists seek to depict subjective emotions, as well as impressionism, characterized by thin, small brushstrokes that evoke movement and the passing of time, generally through depicting changes in light intensity. People in Boston are keenly interested in buying artwork depicting the city, O’Day said. It is a demand the painter is more than happy to meet. O’Day’s paintings have captured cities all over the country, including New York, Chicago, and Detroit, as well as international locations, such as Stockholm. 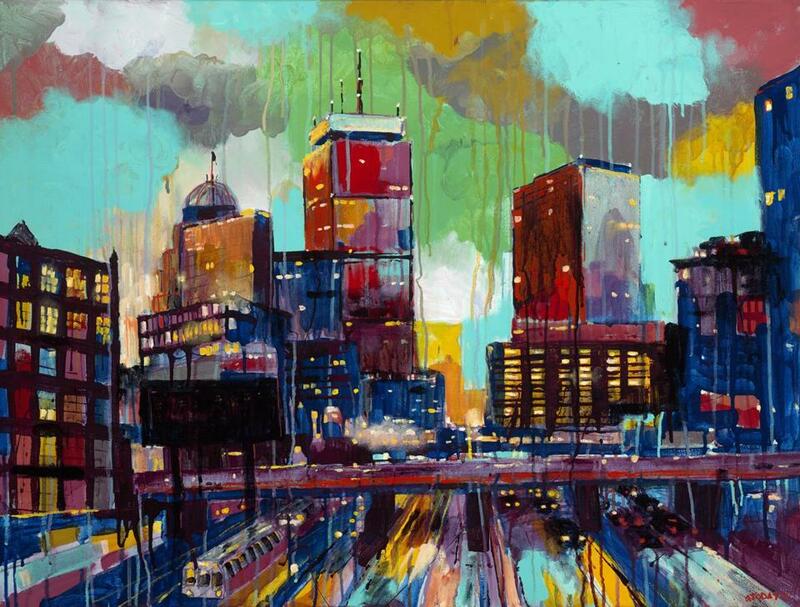 In Boston, his subjects range from skylines to brownstones to the Boston Public Library, and his pieces are often distorted and composed of bright, vivid colors. O’Day, who also illustrates children’s books, is originally from Tennessee and spent his childhood in Michigan, but he considers Boston home now since moving to the city in 2001, he said. 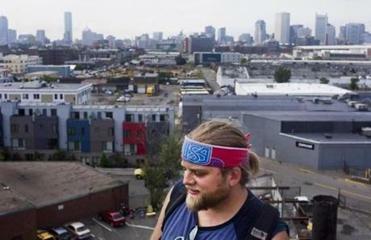 The other finalists offered starkly different perspectives of Boston. “Copley Winter,” by Deb Putnam, shows two lone figures walking near a subway stop in Copley Square on a snowy day. Hues of brown, gray, and blue add a somberness, as does the anonymity of the two people cloaked in heavy winter clothes. Kathleen Douglas’s portrait of the Leonard P. Zakim Bunker Hill Memorial Bridge, called “Zakim and Garden World Series Winners,” is a realistic rendering of the night view of the wide, cable-stayed bridge and its reflection in the Charles River. The TD Garden arena is visible in the background, its red lights shining on the inside of the bridge’s tower. “Whether you like a piece or not, you’re talking about it,” Goodfellow said. “All these pieces offer different perspectives of the city. There’s a diversity of views on Boston.” Goodfellow said it is unclear whether the contest will happen again. She said the contest is part of a bigger push to promote the arts in Boston, which hosts public art displays along the Rose Fitzgerald Kennedy Greenway and at City Hall, among other places. Oliver Ortega can be reached at oliver.ortega@globe.com. Follow him on Twitter @ByOliverOrtega.